The TWS 600S is a versatile pump featuring a patented design, which can be utilized in a back-to-back configuration. 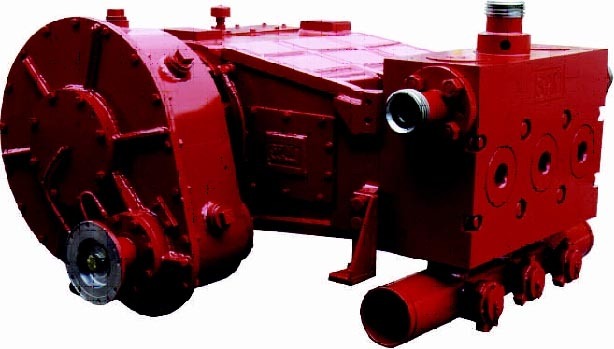 A patented feature unique to the TWS 600S pump is it’s offset crankshaft / crosshead design which substantially reduces the load on both the crosshead and crosshead guides, as well as the main roller bearings supporting the crankshaft. With this patented offset, the pump develops a lower connecting rod angle on the power stroke. The result is reduced wear between the crosshead and the guide, increasing product life. The TWS 600S can be utilized in acidizing, cementing, gravel packing and snubbing operations. 1 .Based on 90% ME and 100% VE - Intermittent Service Only. 2 .For applications demanding pressures over 15,000 psi, contact Weir SPM Engineering. Note: This chart shows this pump’s performance at max hydraulic horsepower. 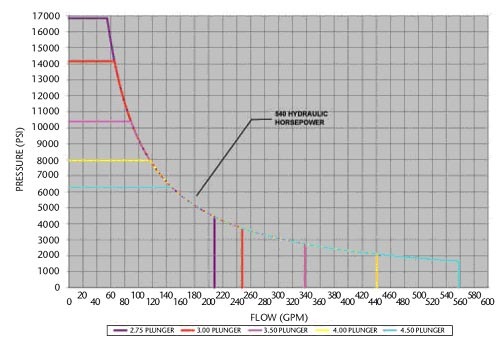 Notice as the plunger size for the pump increases, a greater max flow rate is achieved while the max pressure decreases.